If you know anything about me you'll know I love hummus so I decided to make my own. I personally don't think there is any harm in the chic pea but the paleo police would disagree. 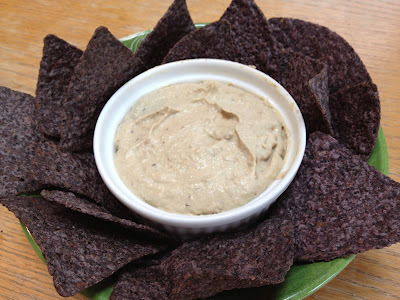 This is my recipe for Babaganosh, traditional hummus made with eggplant. I've made it a few times, with and without roasting the eggplant and garlic. Trust me, it's worth the extra time and effort to roast. Raw eggplant tastes like dirt. Dirt with seeds. Tahini already tastes like dirt so you need something sweet to balance it out. Maybe I should call this Babagadirt since I'm not making it sound very appetizing right now even though it really is. Preheat oven to 375. While oven is preheating wrap whole head of garlic in foil, making sure to seal completely. Cut the eggplant lengthwise, drizzle with olive oil and season with salt and pepper. Place face down on baking sheet along with wrapped garlic head and roast for about 20-25 minutes. Once the egglplant is soft and browned remove from the oven and let cool. At this point, turn the oven off but leave the garlic in there. Once the eggplant is cool enough to handle scoop out flesh into the food processor. Add tahini, salt and pepper, cumin and lemon juice. Blend until smooth. Remove garlic from oven and unwrap foil. The best way to get the garlic out is to cut the tips off the top with scissors then flip it over and squeeze it out from the bottom. Add the garlic to the blended eggplant and blend all until smooth. Taste and adjust seasonings. Done. I served mine with gluten free organic blue chips since I didn't have any homemade crackers.